Seeing a flamenco show in Seville! Seeing a flamenco show in Seville is an absolute must, along with eating tapas and drinking sherry wine! Touristy? Sure– depending on where you go. While the best, most professional shows are indeed put on for tourists, it is this tourism that helps keep this tradition alive. 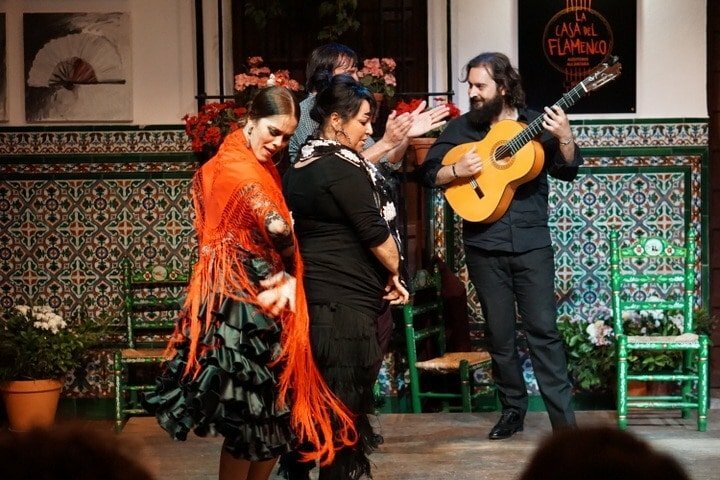 Seville is often argued to be the birthplace of flamenco (watch out if you say that to someone from Jerez, however) and you really can’t go wrong watching a flamenco show in Seville– here’s where to go. When someone from Seville claims that flamenco is in their blood, you’ll see passion light up their eyes. People in this part of Spain are known for their love of music and dance, and their spirited way of life. Despite flamenco’s argued origins (some say Jerez, others Seville, some Granada…), Seville is the perfect place to see a show. You’ll be in for a night of big personalities and lots of passion and noise! While living in Seville I saw a few different flamenco shows, and I always left exhilarated. At the time I didn’t know much about the art form, but my background in dance (I took tap class since I was 2 years old!) made me appreciate each and every move. Since then I’ve seen a handful more of Seville’s flamenco shows while researching for my Seville blog and, more recently, my Seville Tapas and Flamenco Tour. Despite having to choose just one venue for the tour (details below) I really enjoyed each show in its own way. Here I’ll break down the differences between some of the most popular flamenco shows in Seville– though please note that the majority of shows change performers every few days, meaning that the same venue’s shows vary greatly throughout the year. The good thing? No two shows are ever the same at these places! Seville is home to excellent flamenco tablaos, and each venue offers a different take on this beautiful art form. 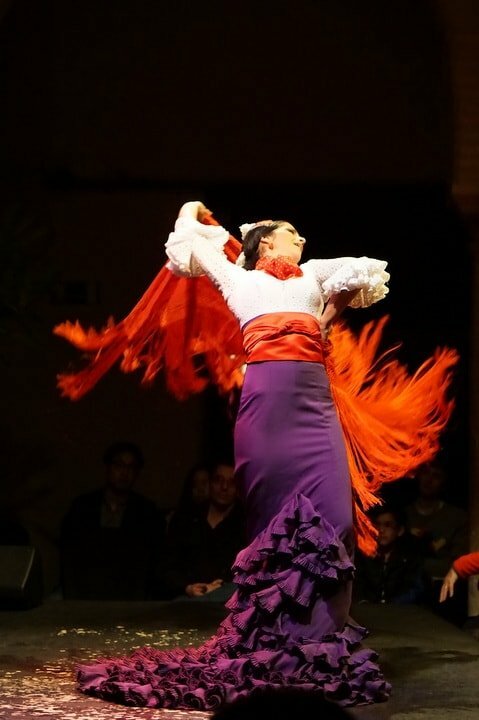 Here are my favorite places to see flamenco in Seville– based on personal research. 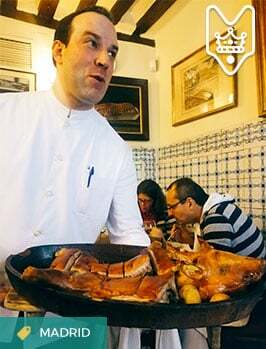 My research was for a reason– we were planning Devour Seville’s Evening Tapas and Flamenco Tour. Based on a concept we first developed in Madrid, this tour goes far beyond eating delicious tapas and seeing a great flamenco show– it also includes plenty of information about flamenco’s fascinating history, complexity and the essential elements that flamenco has beyond dance (which is what most people think about when they think of flamenco). Read on to find out where we go on our Flamenco and Tapas Tour in Seville! The singers and flamenco dancer at a Casa del Flamenco show. You won’t find food and drink on offer here (a good sign! ), as the owners think it takes away from the art. I agree, so grab a bottle of water pre-show, shut off your cell phone, and sit back and enjoy. This venue is absolutely gorgeous, set in an Andalusian patio in the charming Santa Cruz neighborhood. Casa del Flamenco is also famous for not using microphones or amps– just natural acoustics and powerful musicians at their best. 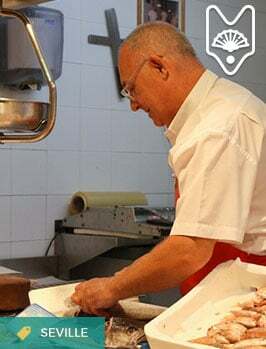 It’s for these reasons that we chose Casa del Flamenco to be our partner on Devour Spain’s Seville Tapas and Flamenco Tour. And our guests so far agree that it’s breathtaking! If you go on your own, get there about 20 minutes early to choose your seats (though the venue is small and intimate, so all seats are pretty great!). On stage at Los Gallos. Photo by randomix on Flickr CC. A classic Seville flamenco institution, this Seville flamenco tablao is hidden away in the Santa Cruz neighborhood. It’s a more expensive show than the others, perhaps because they’ve been putting on quality shows here since 1966! A word of warning– the show is quite long at 1 hour and 45 minutes. I wouldn’t recommend it for children, as I’d stick to a show that’s max. 1 hour for kids. The night we went the main dancer was a portly older man, which (while good) wasn’t my favorite! That said, my flamenco-loving friends swear by this place as one of the most authentic in town. Another of my favorite venues in Seville is Casa de la Memoria. Their nightly show has a great mix of all of flamenco’s important elements: dance, song, and guitar. The venue is gorgeous (and small). People start lining up about 45 minutes before the show to get the best seats in the house. I’d recommend doing the same, as not all seats here are created equal. A gorgeous flamenco dancer makes her moves! I’m torn on this one, as it has the potential to be so great, but falls short in some areas. The museum portion is poorly done, so skip that part of the admission fee. As for the venue, it’s beautiful, and the show is good– if a bit touristy. I brought my parents one year and they really enjoyed it, but my husband and flamenco obsessed friend weren’t crazy about it. Yet because they are a bit more touristy than others, they do offer shorter shows multiple times a night– good for kids! This is another of my favorites! The show is smaller than others (not as many performers) but it’s done with lots of passion and fun. They also own a guitar shop/museum which is worth a visit if you are interested in musical instruments. They will take reservations (which are a must since the venue is so small!). Olé! Photo by Sergio Morchon on Flickr CC. This popular Seville flamenco venue puts on a good show, with an impressive 8 performers the day we went! We didn’t do dinner here (and wouldn’t recommend it), but it’s a good option if you’re staying nearby. I remember T de Triana from my time living in Seville– it wasn’t my hang out, to be honest, but plenty of my friends adored it because they loved dancing Sevillanas, the dance that every Sevillano seems to know perfectly! I tried learning, but couldn’t pick it up! This bar is located on the rowdy Calle Betis, so if you tire of Sevillanos and flamenco, you can bar hop until you find your preference. Thursday and Saturday nights are the best, with dancing starting around 10:30 pm. Another bar located in the flamenco obsessed Triana neighborhood, Casa Anselma is a Seville institution. The first time I went I experienced a bit of culture shock (it was right after moving to Spain) as Anselma herself runs the show and will show anyone she doesn’t like out the door! This is a place where the crowd participates, and there’s dialogue throughout the night. You know it’s authentic when you see the opening hours– doors open around midnight and local Seville artists will pop in and out throughout the night. If you are looking to get a full flamenco and food experience, I’d personally recommend Devour Spain’s Evening Tapas and Flamenco Tour. Of course, I am biased– I helped design it! Tapas and flamenco, a winning combination! The tour completely immerses you in the world of Spanish flamenco from the start, meaning that by the time you get to the show you’ll actually know what you’re watching! I think it’s such a shame that so many people go to a flamenco show without knowing what they’re listening to and looking at– they miss so much! During our 4.5 hour experience, you’ll learn all about the fascinating history of flamenco and the different styles. And while you learn, you’ll enjoy tapas and drinks across three of the city’s best tapas bars. You’ll start with the most traditional, gourmet local cured meats and cheeses, washed down with one of Spain’s most interesting aperitif wines. 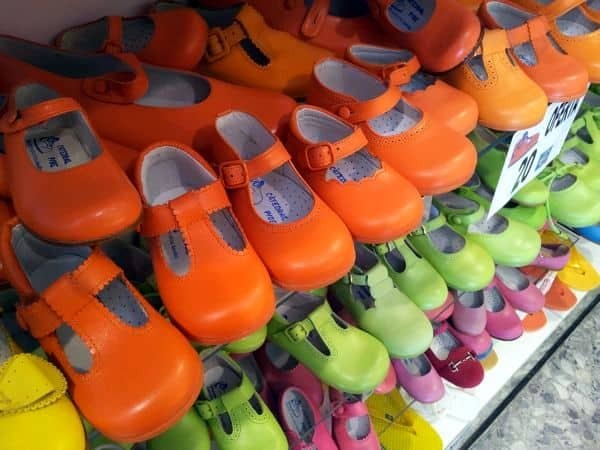 Then, it’s off for a bit of a look at the Santa Cruz neighborhood, where (depending on the day of the week) you might stop to meet a flamenco guitar maker or visit one of Seville’s famous flamenco dress shops! 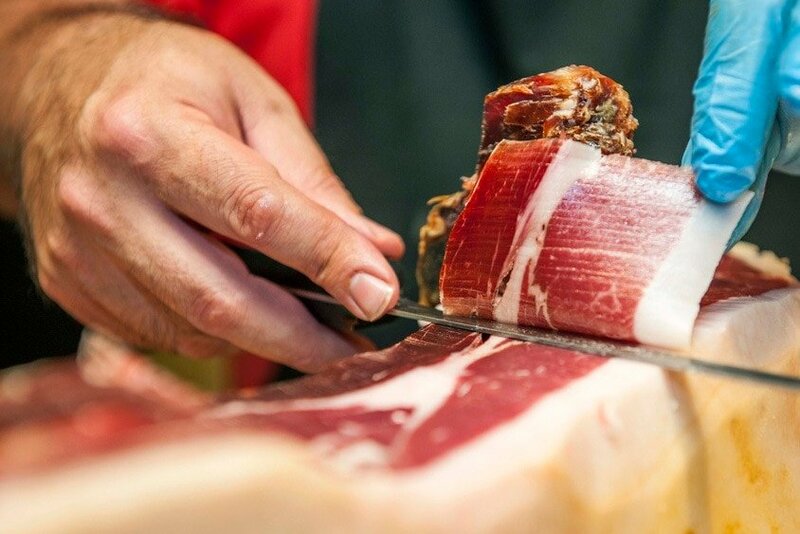 Next, you’ll head to another tapas bar, to try some of the world’s best jamón (ham that sells for over $100/lb) and sip dry Spanish sherry– the most traditional drink in Seville. As you nibble here, you’ll get (my favorite part of the tour) a real explanation of what flamenco is and where it comes from (and what you’re about to see at the show). Putting flamenco in context is invaluable (and super interesting), and makes the show come alive even more. Next, you’ll head over to see the show at Casa del Flamenco, one of the best places to see flamenco in Spain. The dancers, singers, and guitarists are incredible, a whirlwind of energy and passion. When the show finishes you’ll be able to ask any lingering questions (there will be plenty, I’m sure!) and then you’ll head off to feast on more tapas and wine at one of the city’s most popular modern tapas restaurants. You’ll enjoy tapas and wine over the next hour or so, ending with a bit of dessert. I love all of the tours I’ve helped plan (I say that they’re my babies! 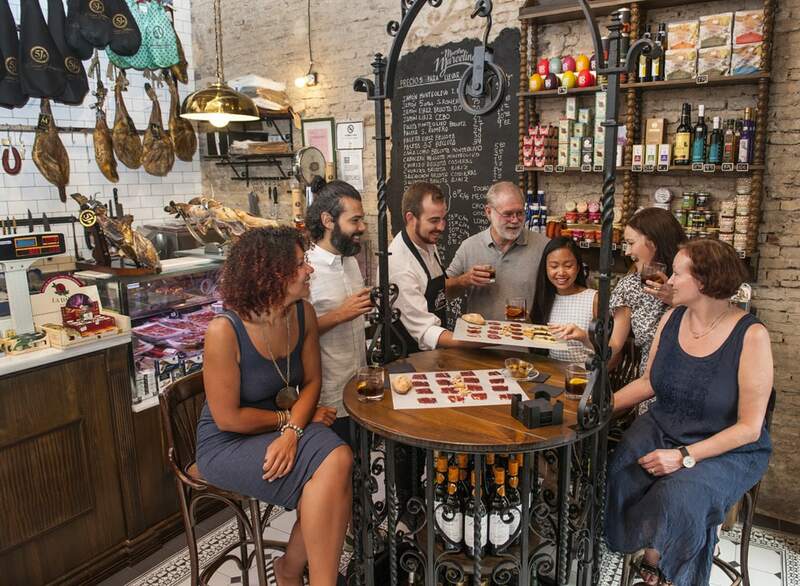 ), but I really love our flamenco and tapas experiences because of the academic nature of the tour (don’t worry, though– it’s still super fun– and includes lots of wine!). If you’ve already fallen in love with flamenco and are ready to learn how to dance it, you’re in luck. 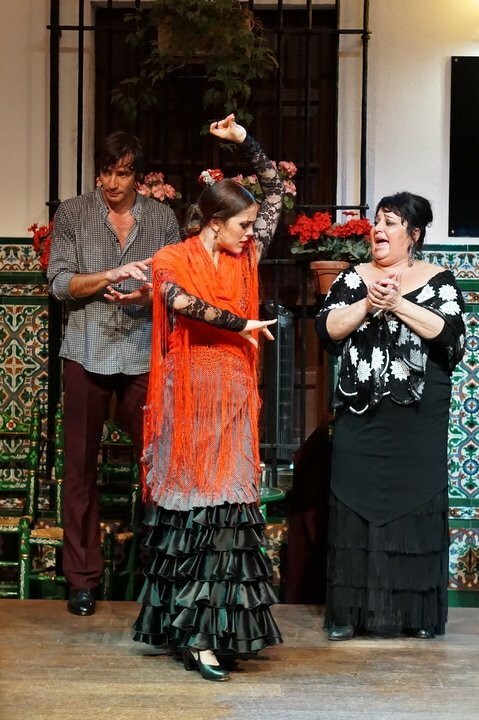 Seville has plenty of great options for taking a flamenco class– we can arrange it too! Just get in touch at [email protected]. Overall– it’s hard to go wrong with the places above. Some are slightly more touristy than others, but all have their merits. My advice? Just go– and then go again and again! Each show is different, as is each city where flamenco is offered. Traveling to Madrid? See my favorite flamenco venues in Madrid here! Seville can’t be all flamenco and tapas! At some point, you have to sleep. Luckily, Seville is one of my favorite city’s in Spain for great hotels. I’ve stayed in my fair share (from budget to luxury) and a couple have really stood out. For boutique luxury in Seville, I love the Alma Sevilla Palacio de Villapanes and also the Hotel Corral del Rey (my parents also loved the latter on a recent trip). Both are super central and are beautiful examples of renovated Andalusian palacios. Read my full reviews of Alma Sevilla and Corral del Rey. Other options include hotels and AirBnB rentals in the area around the Museo de Bellas Artes, or the vibrant Triana neighborhood across the Guadalquivir River. Do make sure that your hotel in Seville has air conditioning and heating. Seville can be extremely hot most of the year, and is surprisingly cold (due to the humidity) in winter. Here you have a full list of recommendations on where to stay in Seville. If you have a tip to share, please leave a comment below! Have you seen flamenco before? What did you think? Do you have any other questions about seeing flamenco in Seville? I’m not well versed in the flamenco scene, but I have NEVER returned to Anslema after hearing her bigoted speech and feeling swindled by her. Rumor has it she’s closed down anyway! Oh no! That sounds traumatic. I will check into it– thank you! I haven’t been to flamenco before, but now by looking at above artical, I am keep to visit it. Love the old Triana attitude to flamenco. Their cheeky, outrageous style may not be the most soulful thing the art has to offer, but it’s so fun! The Tapas and Flamenco tour looks amazing! My husband and I are visiting Seville at the end of February for a couple of days and would love to take in a flamenco show. We will also be traveling with a 13 month old (she travels well – she’s been doing it since she was 4 weeks old!). Do you think the tour is doable with a baby in tow? I can either put her in a carrier, or use a stroller, so that’s not an issue at all, and the length of the tour is ok for her, but what about the tour itself? Would it be kid-friendly at all? She tends to do ok with loud noise, especially if she is in a carrier. I had no idea flamenco was so loud though! Do you offer a tapas and flamenco tour for Seville? I saw the one on your site for Madrid and wondered if you did something similar. Hi Brett– yes! 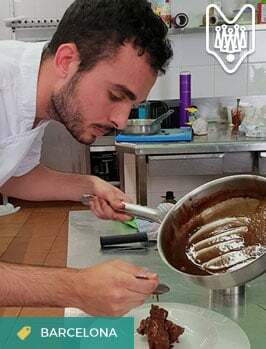 This post describes our tour towards the end, and the link is here: http://devoursevillefoodtours.com/seville-tapas-flamenco-tour/. We hope to have you along! My wife and I will be in Seville March 28&29 and will there be a tapas/ flamenco tour with you one of those days? Hi Lauren, We are planning to o to Seville in June with my family and would like to see an actual flamenco show. 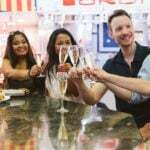 Where would you recommend us to go that is not so expensive because my children who are teens may not be interested and we don’t really drink wine except my husband. Would you know of any place say an open patio that may not necessarily inside a bar. The first one you listed above is in an open patio, would there be a fee to watch it and how much please? Hi Gigi, all shows in Seville are reasonably priced (between 10 and 30 euros, generally) and many don’t even include the option for a drink! I love Casa del Flamenco– it’s where we take most guests on our flamenco tours in Seville! Enjoy! Hi Mick! Tough question– but for cities, it’s up there. Possibly #1 — top 5 for sure. It’s an awesome place with incredible history, architecture, and food. 🙂 Glad you love it too! 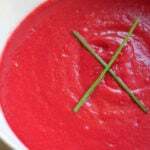 This looks absolutely lovely but we have 2 children- ages 5 and 2. It looked like they cannot go on the tour due to the flamenco show not allowing children under 6. Is this correct? Hi Lindsey, we could definitely check if the venue would make an exception. Flamenco is loud and intense– it can be scary for young kids. Please send us an email at [email protected] and we’ll see what we can do! Thank you for this guide! It helped me decide on where to see flamenco on my holiday just finished in December. Is there a link you can recommend for me to understand more about the different styles of flamenco, so that I can look back at my notes and see what styles I saw? My husband and I are in Seville at the end of January and have booked to see the Flamenco show at the museum for my birthday. I hope it’s OK as I see your review is a bit mixed! The show is at 20.45 and I am wondering about the best way to grab some dinner/tapas around the show. I know many places don’t open until 20.00 so would it be best to wait until afterwards? Is there somewhere near the museum you would recommend? Hope we don’t get to hangry – us Brits are used to eating dinner much earlier! !